Many thanks to all who took part in the March Slow Cooker Challenge bringing us some lovely barbeque flavours created in the slow cooker. Caroline of Caroline Makes started us off with Slow Cooker (Crock Pot) Barbeque Chicken a delightfully straight-forward, throw it all in the pot sort of recipe, just the thing for lazy days when you want a tasty dish with minimum effort. Jane, at Onions and Paper, gave pulled pork another try with The Epic Pork a recipe from Mudpies and Fries. Unfortunately, despite liking the idea of pulled pork, Jane found that she didn't enjoy the texture of the dish. 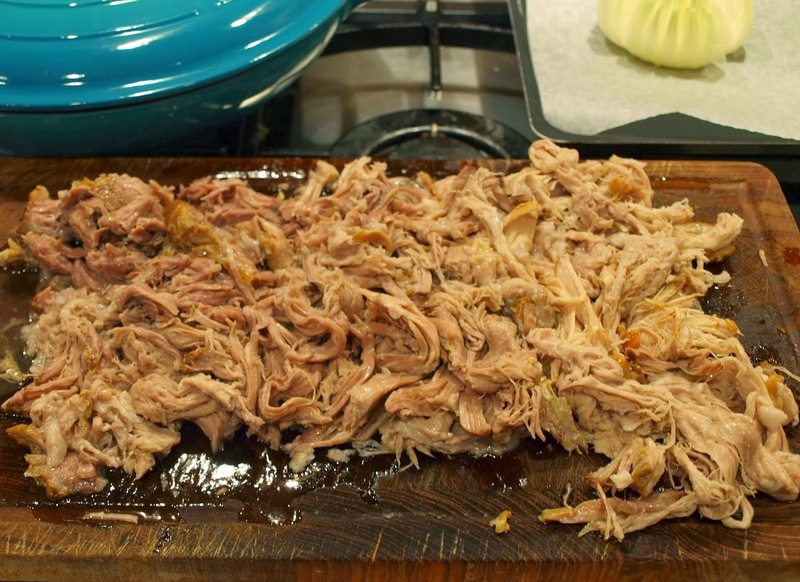 If you like pulled pork in a barbeque sauce, you will probably enjoy this slow cooker version. Even if you don't enjoy pulled pork you should head over to Jane's blog to see the fabulous onion 'flowers'. 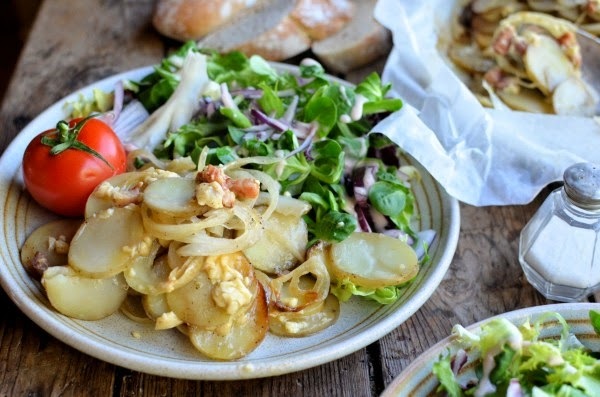 Karen at Lavender and Lovage has taken a different approach to the Barbeque theme, with a potato dish with a smoky BBQ flavour coming from smoked bacon: Irish Slow Cooked Bacon and Potatoes in Paper it would be delicious with sausages, chops or steaks cooked on your barbeque, or even as a lunch or supper dish with a salad, as Karen has done in the photograph. Corina at Searching for Spice takes us on a trip to Japan with a Slow Cooked Pork in Tonkatsu Sauce (Japanese Barbeque Sauce) which she served with pancakes for pancake day! Another fabulous recipe for the Slow Cooker Challenge. Pork seems to have been a very popular choice for a barbeque based slow cooker dish but each one is different. 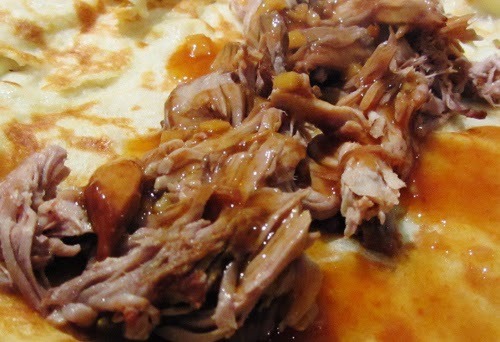 Ness at JibberJabber has gone a bit retro with a Slow Cooker Barbequed Pork with Pineapple, the sauce looks lovely and sticky, just as it should be. Finally, a recipe from Natalie who I met on Twitter @Starcatch3r however, Natalie doesn't have a blog, so she emailed me her recipe and photograph to share. The Barbeque Shredded Chicken recipe was adapted from a recipe on Sugarlaws blog. Natalie served the dish with wedges and corn cobs, added salad for the adults and the children had their chicken on rolls it looks delicious. And the winner of Slow Cooking for Two (picked by Random Number Generator) is Corina of Searching for Spice. Congratulations Corina. 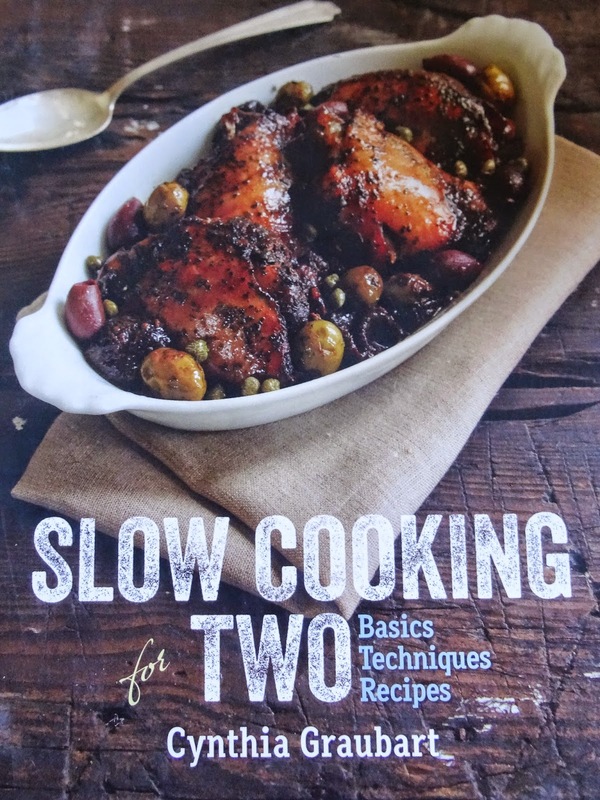 Thanks to PGUK for providing a copy of Slow Cooking for Two by Cynthia Graubart as a prize.